Why Schools Fail To Teach Slavery's 'Hard History' : NPR Ed A new report says too many students don't know the basics of American slavery and too many teachers feel ill-served by bad textbooks and timid state standards. 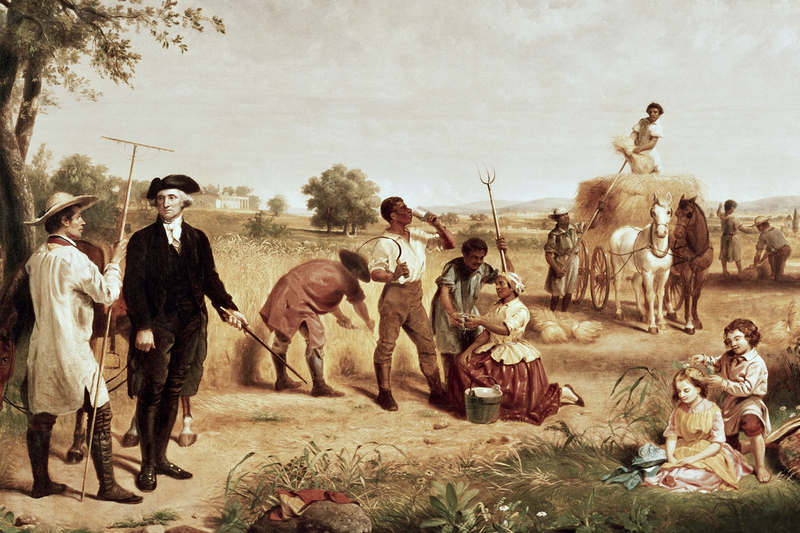 By the time George Washington died, more than 300 enslaved people lived and toiled on his Mount Vernon farm. Painting by Junius Brutus Stearns, 19th Century. This new report, titled Teaching Hard History: American Slavery, is meant to be that intervention: a resource for teachers who are eager to help their students better understand slavery — not as some "peculiar institution" but as the blood-soaked bedrock on which the United States was built. 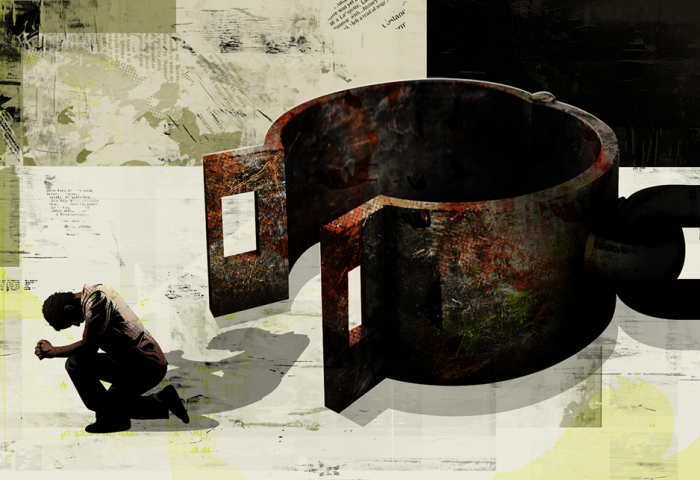 The report, which is the work of the SPLC's Teaching Tolerance project, is also an appeal to states, school district leaders and textbook-makers to stop avoiding slavery's hard truths and lasting impact. The Teaching Tolerance project began in 1991, according to its website, "to reduce prejudice, improve intergroup relations and support equitable school experiences for our nation's children." How Much Do You Know About American Slavery? Take this test and find out. Nearly half blamed taxes on imported goods. Perhaps, the report's authors guessed, students were confusing the Civil War with the Revolutionary War. "Slavery is hard history," writes Hasan Kwame Jeffries in the report's preface. He is an associate professor of history at The Ohio State University and chair of the Teaching Hard History Advisory Board. "It is hard to comprehend the inhumanity that defined it. It is hard to discuss the violence that sustained it. It is hard to teach the ideology of white supremacy that justified it. And it is hard to learn about those who abided it." The problem, according to the report, is not that slavery is ignored in the classroom or that teachers, like their students, don't understand its importance. Many clearly do. The problem is deeper than that. "Although I teach it through the lens of injustice, just the fact that it was a widely accepted practice in our nation seems to give the concept of inferiority more weight in some students' eyes, like if it happened, then it must be true. Sometimes it gives students the idea to call black students slaves or tell them to go work in the field because of the lack of representation in textbooks. So when students see themselves or their black classmates only represented as slaves in textbooks, that affects their sense of self and how other students view them." "I find it painful, and embarrassing (as a white male) to teach about the history of exploitation, abuse, discrimination and outrageous crimes committed against African Americans and other minorities, over many centuries—especially at the hands of white males. I also find it very difficult to convey the concept of white privilege to my white students. While some are able to begin to understand this important concept, many struggle with or actively resist it." Jackie Katz, a history teacher at Wellesley High School in Wellesley, Mass., says student discomfort is a big challenge when talking honestly about slavery. "When you bring up racism, kids start getting really defensive, thinking that they're to blame," says Katz. "To feel comfortable, you need to have a really good classroom climate, where students feel that they're not being blamed for what happened in the American past, where they don't feel shame about it. It is 100 percent not their fault that there is racism in this country. It will be their fault if they don't do anything about it in the next 20 years." This defensiveness from students does not surprise Ibram X. Kendi, a professor of history at American University and author of the National Book Award-winning Stamped From The Beginning: The Definitive History of Racist Ideas In America. "Saying that the deadliest conflict in American history was fought over an effort to keep people enslaved conflicts with students' sense of the grandness of America, the grandness of American history and, therefore, the grandness of themselves as Americans," says Kendi. Textbooks and teachers tend to accentuate the positive, focusing on heroes like Harriet Tubman or Frederick Douglass without also giving students the full, painful context of slavery. Slavery is often described as a Southern problem. It was much, much more. When the Declaration of Independence was signed, it was a problem across the colonies. Even in the run-up to the Civil War, the North profited mightily from slave labor. Slavery depended on the ideology of white supremacy, and teachers shouldn't try to tackle the former without discussing the latter. Too often, the report says, "the varied, lived experience of enslaved people is neglected." Instead, lessons focus on politics and economics, which means focusing on the actions and experiences of white people. States and textbook-makers deserve considerable blame for these problems, according to the report. The project reviewed history standards in 15 states and found them generally "timid," often looking for slavery's silver lining; hence a common preference for coverage of the abolitionist movement over talk of white supremacy or the everyday experiences of enslaved people. "State standards we looked at are simply confused," says Maureen Costello, the director of Teaching Tolerance. "We celebrate the heroes who escaped slavery long before we explain to children what slavery was." Reviewers also studied a dozen popular history textbooks, using a 30-point rubric to measure their engagement with slavery's key concepts. No book scored above 70 percent; five scored below 25 percent, including state-level texts from Texas and Alabama that earned just 6 points out of a possible 87. Teaching Hard History comes out of earlier work the Teaching Tolerance project had done, unpacking how schools teach the U.S. civil rights movement. "One of the reasons that schools don't teach the civil rights movement particularly effectively," says Costello, "is because we don't do a very good job of teaching the history that made it necessary, which is our long history of slavery."